A partial solar eclipse was visible over parts of the southern hemisphere today (Nov. 25), as the moon passed between Earth and the sun for the fourth and final time this year. The eclipse was visible in southern South Africa, Antarctica, Tasmania, and most of New Zealand, according to NASA scientists. At greatest eclipse, as the moon orbited between the sun and Earth, 90.5 percent of the sun's diameter was covered from the location closest to the axis of Earth's shadow, which is a point in the Bellingshausen Sea on the west side of the Antarctic Peninsula. While majority of the Earth was not able to view today's partial solar eclipse, the event was visible in pockets of southern South Africa, across the Antarctic continent, Tasmania and portions of New Zealand's South Island. 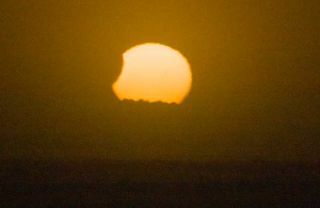 Observer Mike Nicholson and his wife caught the eclipse from Otaki Beach in New Zealand, though they feared at first that the strong winds in the area would blow too much sand and salt for them to see anything. "We left home about 30 mins before the eclipse started, drove to beach, and had to hide in the car as the weather was pretty vile," Nicholson told SPACE.com in an email. "At the time conditions were also extremely hazy; the sun was just a big white blob above the horizon. However as it descended toward the horizon and into the low cloud, conditions improved visually." The shadow with Earth last touched a point on the planet west of the South Island, in the Tasman Sea, before it swept back out into space. Today's eclipse was the fourth and final solar eclipse of the year. Partial solar eclipses previously occurred on Jan. 4, June 1 and July 1. The next solar eclipse, on May 20, 2012, is expected to be a stunning event, and will be visible from China, Japan and parts of the United States. During this so-called annular solar eclipse, the moon will cover a large portion (but not all) of the sun. But, for skywatchers hoping to catch a view of the eclipse, it's important to take adequate precautionary measures. Looking at a solar eclipse can be extremely dangerous, and special eye protection is needed to safely view the sun during partial and annular eclipses. Regular sunglasses do not adequately block enough of the infrared and ultraviolet radiation coming from the sun during the event, so specially designed "eclipse glasses" are needed, NASA scientists have said. These protective eyepieces use appropriate filtration for solar observation. Editor's note: If you have an amazing partial solar eclipse photo you'd like to share for a possible story or image gallery, please contact Clara Moskowitz at cmoskowitz@space.com or Denise Chow at dchow@space.com.